Four teams fighting for two spots in the Big 12 championship game are led by quarterbacks who’ve proven they can take over a game. Oklahoma’s Kyler Murray, West Virginia’s Will Grier, Iowa State’s Brock Purdy and Sam Ehlinger of Texas have been impressive and could determine which teams makes it to the Dec. 1 title game in Arlington, Texas. No. 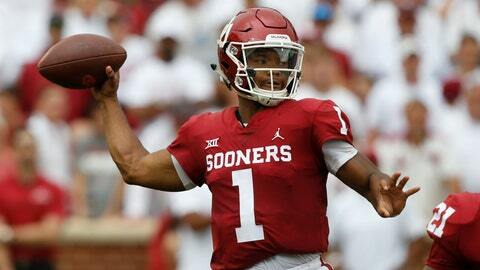 6 Oklahoma (9-1, No. 6 CFP) and No. 7 West Virginia (8-1, No. 9 CFP) are tied for the conference lead with 6-1 marks. No. 13 Texas (7-3, No. 15 CFP) and No. 18 Iowa State (6-3, No. 16 CFP) are next at 5-2. The four contenders have two games left apiece. The Longhorns and Cyclones meet on Saturday. Oklahoma and West Virginia play on Nov. 23. Murray is a two-way threat in more ways than one. Murray leads the nation with a pass-efficiency rating of 212.9, far ahead of Baker Mayfield’s NCAA record of 198.9 set last season when he won the Heisman Trophy at Oklahoma. Murray is tied for third nationally with 32 touchdown passes and the speedster’s 640 yards on the ground ranks seventh among Big 12 rushers. The outfielder was the ninth overall selection by the Oakland Athletics in June’s draft, then postponed his baseball career as he puts together a stellar junior football season. Outgoing Kansas coach David Beaty, whose Jayhawks play the Sooners on the road Saturday, was the recruiting coordinator at Texas A&M when he landed Murray before the athlete transferred to Oklahoma. In two seasons since transferring from Florida, Grier is climbing the charts as one of the best quarterbacks in West Virginia history. The senior has 31 TD passes, is averaging 9.9 yards per completion and his 329 passing yards per game are fourth nationally. After some struggles on offense earlier, West Virginia is averaging 49 points over its last three games, including a 47-10 win over TCU last Saturday. “I think he’s coming off his best performance yet,” said West Virginia coach Dana Holgorsen. “He was lights out against TCU. He controlled the tempo. He understood when to push it, when to not push it. A freshman, Purdy is a reason Iowa State has its first-ever five game winning streak in Big 12 play and is back in the top 25. Purdy had played one series all season before his first significant action off the bench against Oklahoma State on Oct. 6. The Cyclones entered the game last in the league in scoring offense. Purdy threw for four touchdowns in that win, and the Cyclones beat West Virginia 30-14 in his starting debut Oct. 13. He’s thrown 13 TD passes and two interceptions over that five-game stretch. Purdy is completing 69 percent of his passes while averaging 50 rushing yards per game. Iowa State coach Matt Campbell said Purdy plays with humility and knows he has to continue to work at getting better. “For a young guy, he’s doing a really good job for us right now,” Campbell said. Ehlinger set a Big 12 record last week by extending his streak of consecutive passes without an interception to 280 going back to the season opener. The sophomore had a career-high four TD passes, finding Lil’Jordan Humphrey with a 29-yard score with 21 seconds left to beat Texas Tech 41-34.